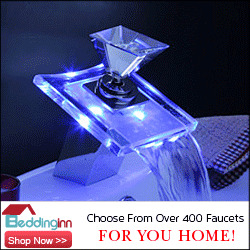 Check out these bath fixtures from Florida's own Jemal Wright. 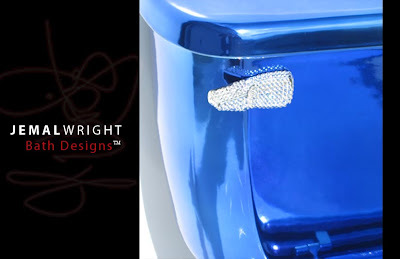 See the whole collection at Jemal Wright. What do you think? 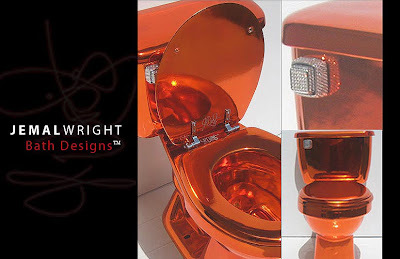 Is bathroom bling a good thing? 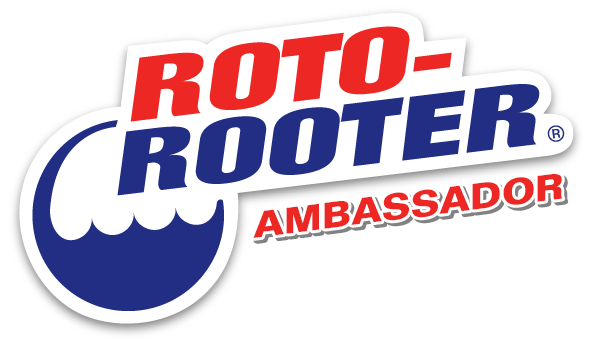 Browsed their site. No pricing listed so I am guessing ..... Bling ..... Ka-Ching! Perfect for the person who has everything. My first thought? This puts a whole new spin on the phrase, "They think their sh*t don't stink!" Sorry for the bad grammar. I couldn't resist. Nim: That toilet and that tub in the same room would create some kind of an energy vortex that would destroy the planet. holy god.. the pop music industry has penetrated bath design... now to rock these suckers i'd have to have a custom matching set of bling grillz fo my mouth yo'z.. so Ke$ha is their first customer right?? It's like something from Missy Elliot's bathroom. MTV Cribs here we come! hey Paul, that's how i knew Tommy Lee would totally buy that "Scary Bathtub" from a couple days ago -- i saw his place on MTV Cribs.. and then i thought, damn, what a huge waste.. if i were that loaded i'd sure as heck have the coolest house known to mankind.. hahaha.. and it wouldn't have gold swans or sleigh bed bathtubs in it... hahaha... and my house would never be on MTV cribs cause that's just weird :) High end design magazines, maybe.. MTV cribs.. NO. 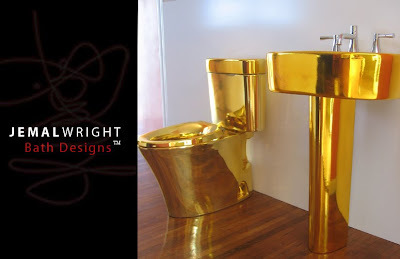 i would put a metallic gold glazed sink and toilet in a powder room in a heartbeat for the right client (read rich and young, and aware that they are going to hate it 7 years), but i draw the line at colors and bedazzling. and i LOVE gold swan fixtures, emilie. srsly. off to check out the bathtub. can't wait. Actually, it was the skillful use of the Bedazzler that caught my eye with these things. Paul you are on a shiny blingey kick... I think there are cats out there fixated on the shiny objects! Wow can you imagine the fun germs living in between the bedazzeling of the trip lever? And do you need to by jewelry cleaner to clean it? 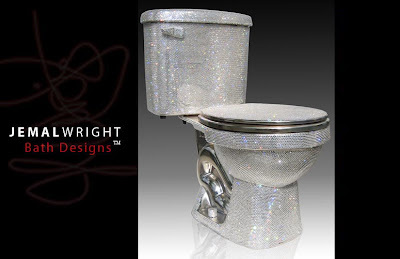 "They'll know you've arrived when they walk in on you sitting on your very own cubic zirconia crapper! The Zircommode is the very finest in bodily excretion technology! Enjoy the convenience of calf exfoliation while you relieve yourself! Smooth the callus from your hands and lower back! It's not just going to the bathroom, it's an entire bodily cleansing experience!" I never thought about the abrasive qualities of Swarovsky before. Great thinking! Pumice stones are so pedestrian. Reminds me how growing up, even modest homes in the neighborhood went gold and fancy in the for-guests half bath. Foil wallpaper is one thing, but this is something else all together. Wow.